Victims of severe dog attacks often suffer acute damage, which may require $250,000 to one million dollars in specialized medical care treatment. Reconstructive surgery, such as skin grafts, tissue expansion and scar diminishment, often requires multiple procedures over a period of years. Medical studies show that pit bulls are inflicting the majority of these damaging attacks. DogsBite.org contains hundreds of accounts of victims of serious and fatal dog attacks. We examine various aspects in great depth to show the multi-layered dangerous dog breed problem. We examine just how easy it is for a con artist, turned sudden pit bull activist, to maneuver from zero shelter management experience to an Executive Director role by creating sham companies, sham websites and a sham resume. After a $1.1 million lawsuit was filed by the mother of a 5-year old child who was mauled in the face by an unconfined emotional support pit bull at the Portland International Airport, all municipal port authorities and airlines are on notice. DogsBite.org is a comprehensive resource containing the foremost studies and statistics regarding dog bite injuries, pit bull injuries, dog bite fatalities, dangerous dog breed ownership and more. Our popular blog tracks serious and fatal dog attacks and dangerous dog law trends across the country. We also track world trends. Fatal dog maulings, mainly inflicted by pit bulls, occur on every continent. View studies from medical researchers, public health agencies and a 13-year dog bite fatality report by DogsBite.org. 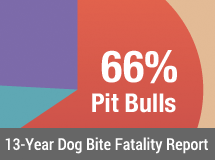 Also, view a collection of quick statistics and our annual dog bite-related fatality statistics. These two sections of the website highlight the most dangerous dog breeds, pit bulls, rottweilers and fighting breed derivatives, and the types of breed-specific laws cities adopt to regulate them. Pit bull terriers were selectively bred for dogfighting. This is why pit bulls don't let go once they bite. 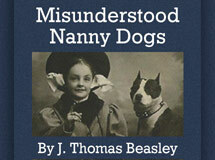 Learn about other fighting breeds, pit bull owners, the false myths they spread and the danger of adopting a pit bull. Many cities have adopted breed-specific laws. View cities and counties, military divisions, Indian reservations and housing authorities that are setting national trends. Also, view a recent appellate decision.